when i was in academia i had to take a philosophy course as a prep for medical ethics. the prof was great. he didn’t even go by the given text. one lesson he gave was about Buddha. how he was a prince that was living a life of luxury. one day there was a dancer that collapsed while dancing for him and he grew disgusted. he decided to give up his wealth and live a life of piety. he had learned to live off of a grain of rice a day. he realized that this also wasn’t living. it was then that he realized there were 2 sides of life: indulgence and sacrifice. and one must determine where what side is ideal for them. what side will eradicate karma. Buddha chose living a life closer to sacrifice (minimalism) was best for him. since my last “minimalism” post, i’ve given away a large portion of my personal belongings. i don’t have anything particularly of value (save my junk silver collection. GAAAAAAR), so it’s not like i’m losing much. but something hit me. 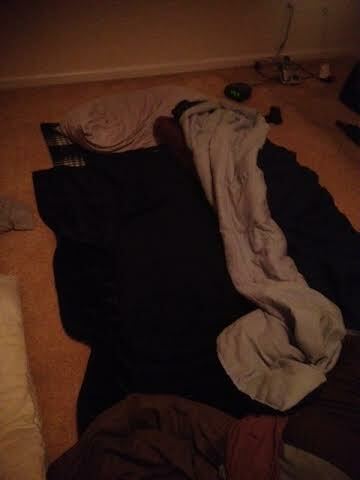 i’ve been sleeping on the floor of my bedroom for over a month. i used to have a hard time falling asleep (unless i was medicated) ordinarily. but recently, i’m out within minutes of hitting the pillow. i wonder how i could sleep so well on the most base of accommodations when i had a bed of luxury (it was a king sized cloud). is it that i’m more comfortable with less, or that i’m more comfortable with the path i’ve chosen? and make no mistake, i WON’T be living a lavish life when i’m done with the navy. i’ll be parked in a travel trailer on the back end of 64 acres of my cousins land in southern La. i don’t think most people would consider that an ideal living situation. but i’ll have a few tree stands for popping deer, a pond to fish from, and ACRES to sit and shoot the guns. i’ll sleep late. i’ll go to welding school and look into a new work situation, but i don’t plan on working much. call it what you want, but i’m looking forward to living a life of less. but i do feel sorry for my mother. i’m her only son and her oldest child. all she wants is for me to have kids; but i think she’s finally wrapped her head around the fact that she won’t be getting any from me. not to take anything away from the obvious benefits of your path towards minimalism, but do you think it could be because you needed a much firmer sleeping surface? not really. i’m out hella quick now. i’ve slept on hard surfaces before and had a hard time falling asleep, so i doubt it. I have found that the softer the sleeping surface, the less I move around (turn over, etc.) during the night, with the result that I am stiffer, aching and less rested come morning. Humans are designed to move around, and holding one posture for too long, even when you sleep, is just not good for you. i’m not gonna analyze it. i’m just happy i sleep so well now. The only thing a man truly owns outright is his own free will. People can and will try to change your choices to better suit themselves or others. Earthly possessions can be lost, given, taken, acquired, bought, inherited, or coerced either forcibly or freely. Family is a blessing because someone (parents) sacrificed something for someone they didn’t know (their own kids), but got to know through this thing we call life. Around the same time I ran into the manosphere, I took a course taught by an ex-Cambridge prof on what it takes to live a truly ‘good’ life. We read Aristotle’s Nicomachean Ethics, the Bhagavad Gita, St. Augustine’s Confession, and the Myth of Sisyphus, among others. It was probably my favorite course to date, and probably one of the only memorable ones of my post-sec education, because I actually enjoyed the material and the lessons she taught us. One of the ideals behind the ‘good’ life was minimalism. Go figure – we already knew what it took two millenia ago, if not more; very few of us are truly willing to make sacrifices though. well, it’s very likely that once i get settled i’ll quit updating the site. it’s something i’ve been mulling over. You’ll move on eventually, that’s no surprise. Here’s to hoping it’s later rather than sooner. I’ll cross that bridge when I get there. I think you’re onto the correct conclusion…and sleeping (or how well you sleep) is probably a good indication of how calm you are on the inside. When you are in turmoil (stress, confused, questioning your path, etc.) there is not way to really be calm – exercise, meditation, diet – all probably help, but that turmoil is has a cause, and until you find it, analyze it and then resolve it – you can’t be “calm” – therefore, sleep is disrupted. So you’re sleeping better because you are calm and at peace with yourself. Nothing wrong with that my man. In fact , congrats on that. once i’m out, i don’t wake up until the alarm goes off. Sounds great. I’m envious. Just don’t forget and do something stupid like get married. You’ll lose all and gain nothing. go back and read “the ring”. lol. Probably the coolest thing about minimalism is that you really have time to decide what is important. And maybe staying minimalist will be the way to go. But you have the choice and can choose that or something else. It’s a good way to go bro, I’m glad for you. thanks man. i’m looking forward to it. i’m really looking forward to my retirement. thanks for commenting. One of the important things about that lesson is that Buddha went from being a prince to being an ascetic and realized that the true path to enligtenment is the middle path. In many ways that’s the hardest one to stay on since we tend towards extremes. I’ve visited a few Buddhist monastaries and the life there is simple, but not one of deprivation. The beds are comfortable enough, the food is good, the facilities are adequate, etc. So, it sounds like you are headed in the right direction. My room-mate is Buhhdist and she approves of this message. I appreciated the general concept of what you were going for, but thought going to the extremes you were was a bit too much. Been thinking a bit lately about the idea that so much crap bought is bought by, at the behest of, or for women, and how little happiness all that stuff brings, particularly for guys. I think, or perhaps am realizing now, that guys by nature are minimalist, given free reign. And I don’t just meant physical objects, I mean all ‘effin societal clutter we accumulate, and all the bureaucracy that comes with it. Used to be worth it as a guy to buy into it because of what it entailed in being appreciated by women, but that’s been already for all sorts of reasons the Manosphere has laid out. I know I am tired of it. It’s December…again, and I wonder where my year has gone…again. I am outside, trying to put half working Christmas lights in my bushes, knowing once again this weekend I will get to very little of what *I* would like to do, and soon it will be December…again! I guess what I am trying to say with my mini-rant is that I truly get what you are doing and I envy you for it. do yourself a favor and get the book “dirt cheap survival retreat” and give it a read. also try “enjoy the decline”. both are great books that i think all men should read. maybe reading them will also put you on a path of minimalism. trust me, i haven’t felt this centered in my whole life.